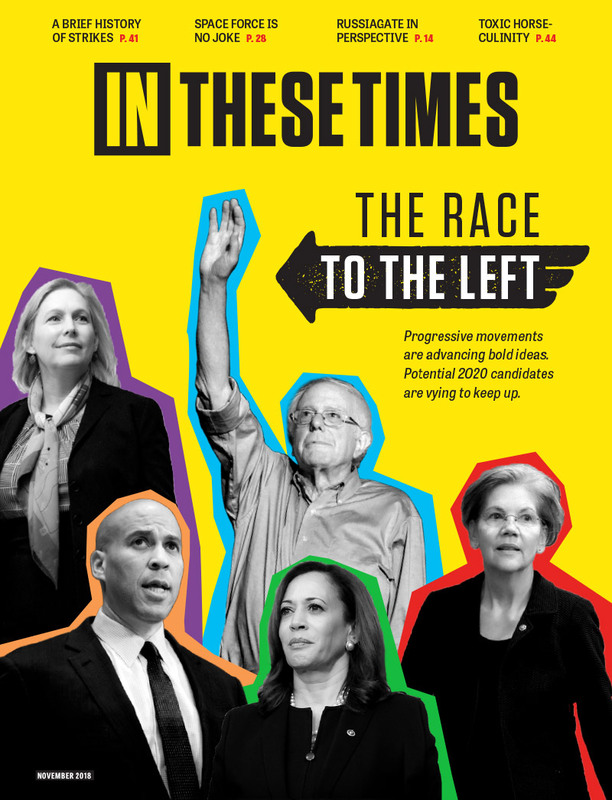 This story is a sidebar to Corporate Con Game, In These Times' July 2010 cover story. 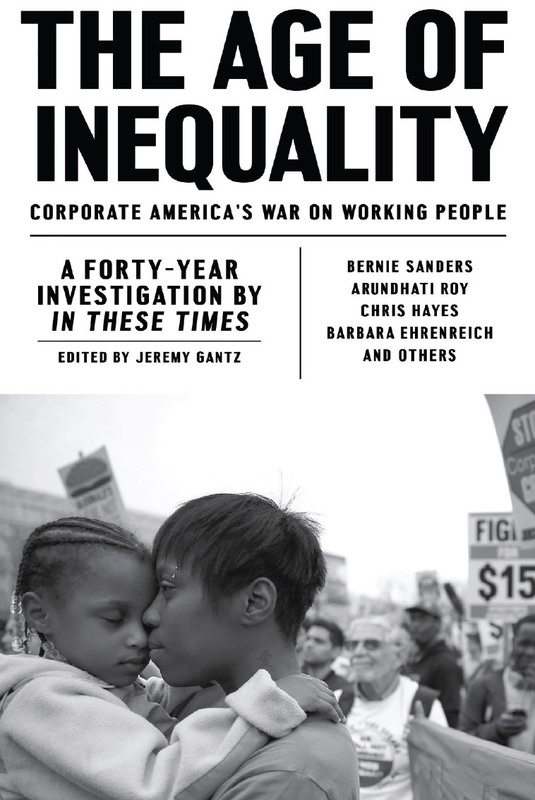 This story accompanies Corporate Con Game, In These Times’ July 2010 cover story. Over the past several years private-prison companies Corrections Corporation of America (CCA) and the Geo Group, through their work as members of the American Legislative Exchange Council (ALEC) and through their ties to the Arizona Legislature and the office of Gov. Jan Brewer, have had ample opportunity–and obvious intent–to ensure the passage of S.B. 1070. According to Sen. Russell Pearce and Brewer’s spokesman Paul Senseman, the S.B. 1070 went through a lengthy edit and review process that took place predominantly within the Arizona Legislature and the offices of the Maricopa County Attorney and Gov. Brewer. A little over a week after Pearce introduced S.B. 1070 on the floor of the Arizona Senate, CCA enlisted Highground Consulting, one of the most influential lobbying firms in Phoenix, to represent its interests in the state. Lobby disclosure forms filed with the Arizona Secretary of State indicate that Maricopa County also employed Highground during the time of the bill’s formation. Highground’s owner and principal, Charles “Chuck” Coughlin, is a top advisor and the current campaign manager of Gov. Brewer. 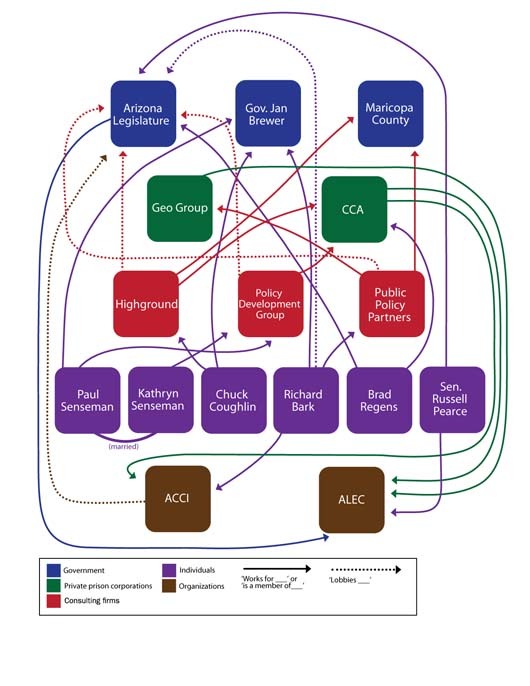 State lobby reports show that Brewer’s current spokesman, Senseman, previously worked as CCA’s chief lobbyist in Arizona as an employee of Policy Development Group, another influential Phoenix consulting firm. His wife, Kathryn Senseman, is still employed by Policy Development Group and still lobbies the legislature on behalf of CCA. In other words, in 2005 and 2006, as Arizona legislators–many of them ALEC members–were drafting provisions of what would eventually become the “Breathing While Brown” law, Brewer’s director of communications, Senseman, was lobbying them on behalf of CCA. Brewer’s “chief policy advisor,” Richard Bark–a man Senseman and Pearce both say was directly involved in the drafting of S.B. 1070–remains listed with the Office of the Secretary of State as an active lobbyist for the Arizona Chamber of Commerce and Industry (ACCI). CCA is a “board level” member of the ACCI and is the top employer in Pinal County, located just south of Maricopa County, where it operates five detention facilities for both state prisoners and immigrant detainees. CCA has also shown special interest in Arizona through recent hiring decisions. In 2007, CCA hired on Brad Regens as “Vice President of State Partnership Relations” for the purpose of cultivating new contracts in Arizona and California. In the two years immediately prior to his employment at CCA, Regens had worked in the Arizona House as director of fiscal policy. Before his appointment as director of fiscal policy, Regens had spent nine years working in the state legislature in various roles, including assistant director of the Arizona Joint Legislative Budget Committee. During this week, at the end of August 2012, the state of Arizona has given a contract for 1,000 prison beds it clearly doesn't need to CCA. The outcome should hardly be a surprise, given the above investigative piece. Indeed in the two years just prior to the issuance of the state's RFP, CCA tried to get approval for constructing prisons in Dolan Springs, WIckenburg, Prescott Valley, Camp Verde and WInslow, Arizona. There was no need for any of them either, at the time. This gave rise to a reasonable basis for the supposition that CCA actually may have written its own RFP, a tactic aimed at eliminating any fair competition that might have been generated by the ultimate issuance of the call for new beds. In this story, along with the accompanying article, "Corporate Con Game," author Hodai accurately predicted the outcome of this eventual assault on the state treasury. More importantly, his exposure helped defeat the original attempt to build a total of 5,000 unneeded for-profit beds at taxpayer expense. In my estimation, Hodai has saved the Arizona taxpayers from footing the bill for a good quarter-billion additional dollars worth of pork. .Do you know whether the watches private prison industry has contributed to the campaigns of Russell Pearce, John Kavanaugh or Joe replica watches Arpaio? It ‘s an important question. Do you know whether the jewelry private prison industry has contributed to the campaigns of Russell Pearce, John Kavanaugh or Joe handbags Arpaio? It ‘s an important question. Do you know pass4sure whether the private prison industry has contributed to the campaigns of Russell Pearce, John Kavanaugh or Joe Arpaio? It ‘s an realexam important question. Do you know mcse whether the private prison industry has contributed to the campaigns of Russell Pearce, John Kavanaugh or Joe Arpaio? It ‘s an mcdst important question. Do you know whether the private prison industry has contributed to the campaigns of Russell Pearce, John Kavanaugh or Joe Arpaio? It 's an important question.